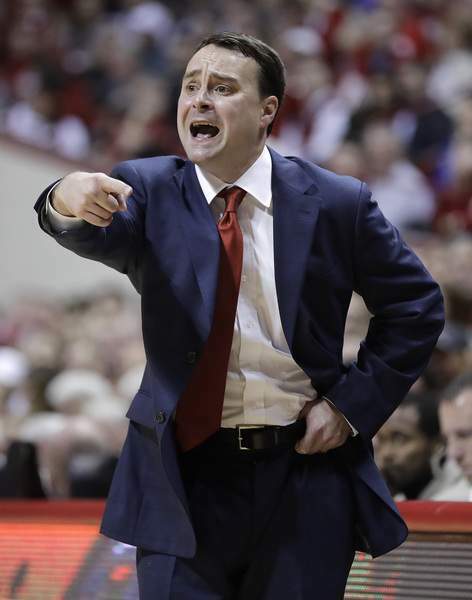 Associated Press Indiana head coach Archie Miller shouts at his players during the first half Friday. BLOOMINGTON — I expect Indiana to look substantially better tonight, because ... well, it can't get much worse. Indiana State lit up the Hoosiers in an embarrassing season opener Friday night, and the baffling part of Indiana's 90-69 loss was how the game was so uncompetitive. Usually in college basketball, home teams make a run in the second half. After going down 17 midway through the first half, IU never mounted a challenge the rest of the evening. "When you're at home and address some things at halftime and come out and give up four straight scores (to start the second half), that's not good enough," IU coach Archie Miller said. "I've been in a lot of games where you don't play particularly well in the first half, but those guys come out the second half and are ready, guns blazing, get back in it and cut it right back down to a working margin. We have to have much more resolve about us that we're willing to keep grinding away." Tonight certainly looks like a get-well game for Indiana. Howard, a team from the Mid-Eastern Athletic Conference, is 0-2 all time against the Hoosiers, who have compiled a 13-0 all-time record vs. MEAC opponents. 1. Offensive adjustments: In part, Indiana's offensive woes Friday may have been a consequence of addressing last season's weaknesses. Miller noted in the preseason that the Hoosiers had tended to spend extra practice time on defense rather than offense, so perhaps Indiana's formerly potent attack suffered as a result. The Hoosiers began pressing and forcing shots once Indiana State built a double-figure lead. Look for an extra dose of ball movement tonight. 2. Hands off RJ Cole: Howard's freshman guard had 23 points and six assists Friday when the Bison fell 84-75 at George Washington. A closer examination reveals he got 14 shots from the charity stripe, making 11. Can Indiana avoid the whistles and defend Cole without fouling? 3. Higher energy level: The Hoosiers need to come out much more fired up than they were in the opener. Indiana State hit a bunch of 3-pointers to start the game, with the Hoosiers trailing behind in their rotations.